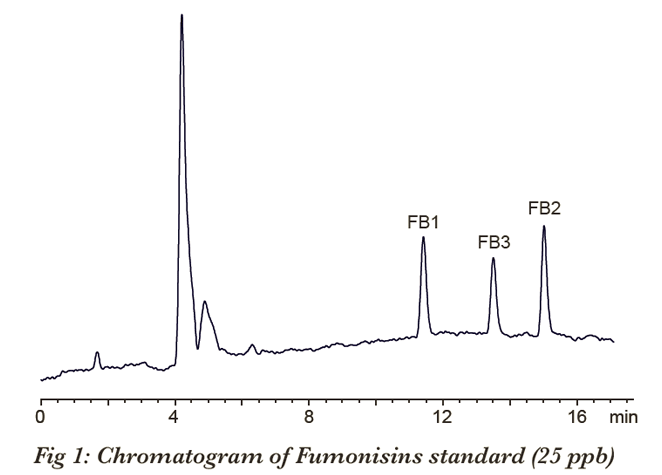 Fumonisins are a group of naturally occurring Mycotoxins produced by Fusarium moniliforme fungi species that grow on corn and other commodities. Fumonisins are suspected human carcinogens and are toxic to pigs, poultry and horses. Environmental factors, such as temperature and humidity, affect the occurrence of Mycotoxins and contamination can happen in the field as well as during storage. Many countries set limits on the presence of Fumonisins in foods and feeds and testing of raw crops as well as finished products is done on a regular basis. A simple and sensitive method to detect Fumonisins involves using an HPLC to separate the toxins and then converting them using post-column derivatization with OPA into highly fluorescent derivatives. 1000 mL D.I. water) : MeOH.